I suspected Trump’s surprise electoral victory was Russia’s doing, until I discovered an important puzzle piece I knew nothing about. Now I believe the meddler extraordinaire was more complicated, sinister, and insidious than Kremlin hacking alone. Have you ever heard of “psychometrics?” I hadn’t until I happened upon an article called “The Data That Turned the World Upside Down” (Das Magazin). Psychometrics or psychographics measures the “Big Five” personality traits: openness, conscientiousness, extroversion, agreeableness, and neuroticism. Originally developed in the 1980s through long and complex questionnaires, personality analysis catapulted into the future when Polish psychology student Michal Kosinski arrived on the scene at Cambridge University. He and fellow doctoral candidate David Stillwell developed the immensely popular MyPersonality app based on the Big Five, which was “shared” and “liked” exponentially. The psychometric scores, combined with Facebook profiles, soon became the largest database ever collected. I decided to be a guinea pig and take Kosinski’s Big Five Personality test based on my Facebook profile. The result of the test showed that my five personality traits are: 1. Openness: 81 percent liberal and artistic vs. conservative and traditional; 2. Conscientious: 46 percent impulsive and spontaneous vs. organized and hardworking; 3. Extraversion: 27 percent contemplative vs. engaged with outside world; 4. Agreeableness: 51 percent team working and trusting vs. competitive; and 5. Neuroticism: 29 percent laid back and relaxed vs. easily stressed and emotional. Further explanations are provided at the end of the test results. You can take the University of Cambridge Psychometrics Centre personality test at applymagicsauce.com based on your Facebook history or text that you’ve written. But user beware. If you are concerned about your personal privacy and how likely you are to be strategically targeted, you might care to know that with fewer than 100 Facebook “likes,” data companies know a person’s skin color, intelligence, family status, religious, sexual, and political preferences. With 300 “likes,” they know a person better than their partner does, some studies claim. Combined with Messenger, Google searches, purchases, and whereabouts with or without phones in our pockets, our lives are open books. We benefit from certain rewards, but are easy targets, unaware of how vulnerable we are to manipulation from sites that collect personal information on our personality traits, consumer, and political preferences. Artificial intelligence is a formidable foe. The plot thickened when I learned that a company called Cambridge Analytica secretly registered in 2013 to influence U.S. elections. They sent a psych student named Aleksandr Kogan to buy Kosinski’s and Stillwell’s information gathering techniques. But when Kogan was turned down, he moved to Singapore and changed his name to Dr. Spectre, while Cambridge Analytica copied the inventors’ highly efficient people search engine model and used it for sinister use. Instead of blanket advertising, Cambridge Analytica individually and covertly targeted voters of a precise age, opinion, preference, and voting district with “dark post” newsfeed messages specifically designed to sway their votes, according to an article titled “The Secret Agenda of a Facebook Quiz,” which appeared in the New York Times. Its mother company, Strategic Communication Laboratories (SCL), was the foremost election management agency. They conducted “psyops,” psychological operations of mass propaganda aimed at people’s emotions, to “manage” elections and refine their operations in Nigeria, Nepal, the Ukraine, Eastern Europe, Afghanistan, and Pakistan. Then I read on Wikipedia that in 2014, Cambridge Analytica played a role in boosting republican candidates in 44 political races across the U.S. They worked for Ted Cruz’s presidential run in 2015. In 2016 Marco Rubio spent $3 million for CA’s services and Ben Carlson spent $220,000 for their “data management” and “web service.” With each campaign, they refined their edge. Even Donald Trump, who paid Cambridge Analytica $15 million, was surprised by their effectiveness in strategically influencing his electoral win. Cambridge Analytica CEO Alexander James Ashburner Nix boasted on telegram.com, “We are thrilled that our revolutionary approach to data-driven communication has played such an integral part in President-elect Trump’s extraordinary win.” He’d made the same speech before when his company helped the UK’s pro-Brexit election in Leave.EU. No wonder Trump then tweeted he’d be called “Mr. Brexit.” Of course, Nix, Trump, and other GOP White House staff later denied that Cambridge Analytica’s personalized political propaganda played a pivotal role in the election results. Why in the world would Cambridge Analytica be interested in Trump’s victory? Who owns the company? What would they gain? Robert and Rebekah Mercer, the extreme right wing hedge fund billionaire father and daughter who heavily funded Cambridge Analytica and the Republican Super PAC. Deborah served on the Executive Committee of Trump’s transition team and is “the most powerful woman in GOP politics” according to Politico. Guess who was, until recently, a VP on their board? Trump’s chief strategist Steve Bannon. Whoa! I thought. This is huge!!! This goes way beyond fake news and makes calls to the Russian Ambassador look like child’s play. I followed leads to try to unravel the mystery. Cambridge Analytica has psychological profiles on 220-230 million Americans based on 5,000 different bits of data. Cambridge Analytica has 175,000 different versions of political ads to laser-target voters and influence elections. In 2016, the Mercer Foundation was the top sole donor to Trump and to federal candidates with a sum of $32 million. Cambridge Analytica offices are not located in Europe where privacy is protected, but in the U.S. because of our lax laws. Our near sighted Senate just voted to further undo privacy legislation! But it doesn’t stop there. Robert Mercer donated Cambridge Analytica’s services to UK Independence Party’s Nigel Farage, his good friend, for the Brexit Leave.eu campaign. When Mercer met Breitbart, it was a match made in heaven (or hell!). Mercer funded Breitbart.com to “take back the culture” according to Bannon who took over Breitbart when its founded died. Bannon launched the London Breitbart in time to influence the UK’s election, and plans to do the same in France and Germany, according to theguardian.com. Mercer doesn’t believe in government and thinks it should be shrinked to near non-existence. He doesn’t believe in any social services. Mercer supported Bannon’s and Kellyanne Conway’s appointments to senior positions in the Trump campaign and White House. Rebekah Mercer worked with Bannon on creating the anti-Hillary propaganda film, “Clinton Cash.” The FEC Federal Election Commission and FBI have been asked to look into the highly suspicious Mercer-Super PAC-Trump connections, according to Newsweek. Oh my! For those of us who are already addicted to Facebook and have “liked” and “shared” our way across cyberspace, it’s too late. For those who are too old or too young, save yourselves! Big brother is indeed watching and only God knows how this will affect our present and future lives. I am trying very hard to envision a future where our society is in sync with our souls, where our “better angels” sit on our shoulders and call forth our greatest good. . . I envision a society where all people are valued and treated with kindness and tolerance, where government serves the people with compassion and respect. I envision programs that raise each citizen to their true potential. In looking critically at what is transpiring in our nation now, I hope that we are growing stronger by recognizing the dissonance of our values and new reality. We as individuals are reading between the lines, listening attentively for the distractions and comments that could put us off balance. Instead, we see them for what they are. In the nature of the cycles of a capitalist society, we’ve swung from the Era of the New Deal to the Era of the Alt. Right, led by the Good Old Boy Billionaires’ Club. But through our power, we will arise, look around and find our center, to recreate and regenerate a great society that meets all of its peoples’ needs. Marguerite Jill Dye is an author, artist, and activist who lives in the Green Mountains and on Florida’s Gulf Coast. She is the illustrator of a children’s book, “Where is Sam?” and wrote and illustrated a yet-to-be-released book on walking the Camino de Santiago pilgrimage across Spain: “Treasures Along the Camino: An Artist’s Empowering Journey Across Spain.” Jill and her husband Duane will walk the most challenging Camino del Norte this fall. 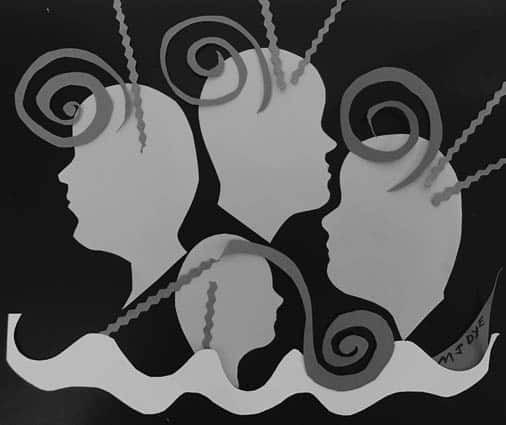 “Mind Manipulation 101,” a paper cut assemblage created for this week’s column.